A standard 9x9 Sudoku matrix. Image credit: Héctor Rodríguez. (PhysOrg.com) -- A new analysis of number randomness in Sudoku matrices could lead to the development of more difficult and multi-dimensional Sudoku puzzles. In a recent study, mathematicians have found that the way that numbers are arranged in Sudoku puzzles is even more random than the number arrangements in randomly-generated matrices. The counter-intuitive discovery may enable researchers to develop algorithms that generate Sudoku matrices with fewer clues, making them more difficult to solve. Mathematicians Paul Newton and Stephen DeSalvo of the University of Southern California in Los Angeles have published the results of their study in a recent issue of the Proceedings of the Royal Society A. "I think it will help develop multi-dimensional Sudoku puzzles, and answer questions about how to give the initial [clues] in order to create a hard, but still solvable Sudoku puzzle," Newton said in an article at ABC Science. Sudoku is a number puzzle consisting of a 9x9 grid, whose 81 boxes are filled in with the numbers 1 through 9 in a way that meets certain criteria. Each number can only appear once per row and once per column, as well as only once in each of the nine 3x3 sub-grids that make up the matrix. In 2006, researchers (Felgenhauer and Jarvis) found that there are about 6.67 x 1021 different Sudoku matrices that satisfy these three criteria. In contrast, the total number of different 9x9 randomly generated matrices is much greater: 981. The ratio of these two numbers, or the probability of randomly generating a Sudoku matrix by randomly selecting each number in each box independently, is very small: about 3 x 10-56. This small probability results from the constraints put on Sudoku matrices. In their study, Newton and DeSalvo wanted to find out how exactly random a Sudoku matrix is, given these constraints. To answer this question, they generated a representative sample of about 10,000 matrices and compared them to randomly generated matrices. They were surprised to find that Sudoku matrices are actually more random than randomly-generated matrices. This result is counterintuitive since you would expect that, the more constraints on a matrix, the less random it will be. Instead, the rules of Sudoku seem to “weed out” matrices with patterns. For example, as Newton explained, a randomly generated matrix could potentially consist of all one number, alternating numbers, or some other pattern not allowed in Sudoku. The imposed high level of number distribution in Sudoku gives it a higher level of entropy, making it more random than random matrices. Newton and DeSalvo predict that this greater understanding of Sudoku could lead to better Sudoku-generating algorithms that create more difficult puzzles. Currently, Sudoku puzzles require at least 17 numbers to be given in their correct boxes in order for the puzzle solver to find a unique solution. The new study could decrease that number, making it more difficult to solve the puzzles. Future algorithms might also develop more complex 3D Sudoku cubes. "I think it will give people a lot of insight into how to produce better algorithms for constructing Sudoku matrices and it will enable ultimately the very fast learning algorithms that solve Sudoku matrices," Newton said. Australian mathematician Marcel Jackson of Latrobe University in Melbourne, who was not affiliated with the study, added that understanding Sudoku matrices better might also be useful in coding information to minimize the effect of errors in transmission. -- Paul K. Newton and Stephen A. DeSalvo. “The Shannon entropy of Sudoku matrices.” Proceedings of the Royal Society A. doi: 10.1098/rspa.2009.0522. I disagree with this finding. It cannot be more random than "random", because in a "random" matrix there is NO pattern, there might appear to be a pattern, but in reality even that is an illusion. In Sudoku, there is ALWAYS a pattern, and by rule/definition, there must be a pattern. I think this "more random than in random generated matrixes" is a bit misleading. Numbers in Sudoku matrices tend to be very evemly distributed (this is a direct result from the way the rules are formulated). So a sudoku matrix is closer to the mean (on average) than a purely random matrix. Oh, I *HOPE* this is a case of mathematics->journalism mistranslation! In a truly random matrix, determining any particular cell gives you *NO* information on what's in other cells. 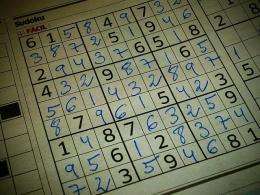 Whereas in a Sudoku, each cell you know gives you more and more information on the others. In the degenerate case, knowledge of four cells can completely specify a fifth cell, even if *NOTHING* is known of any other cell in the grid. Soo... seriously, "more random than random" is just crazy talk! I believe this is a case of scientific language being dumbed down into journalistic language and losing some of its meaning in the translation. When the article says that the Sudoku puzzle is more random, I believe it means that there is a smaller chance of repeated patterns in the sudoku puzzle when the digits are read as a string. "The imposed high level of number distribution in Sudoku gives it a higher level of entropy..." should give you an idea of what they're trying to tell us. What they're saying is that 10,000 randomly generated sudoku puzzles have, on average, fewer repeating patterns, and therefor a higher degree of entropy than would 10,000 random 9x9 grids of digits. A grid of 81 1s, for example, might possibly be RANDOMLY GENERATED, but is much less RANDOM than a sudoku puzzle which in turn is less random than a grid of 81 unique symbols given in no particular order. why not use a transforming 3d sudoku matrix to perform encryption? The fact that the columns add up, and that rows add up, and boxes add up, you should be-able to use this to obscure the original data pretty good, and I'd suspect the amount of bits that could be used to represent such a matrix would definitely be more than current bit width and the key would look like a harmless sudoku puzzle. A purely random matrix might not (and in all probability will not) have such an even distribution of numbers. So a sudoku puzzle will always have the maximal possible entropyn whereas a randomly generated matrix will likel have a lower entropy. In physics entropy is defined as the number of assessable states for a system. A system with 9^81 possible states has a much greater entropy than one with only 6.67x 10^21. I agree with mklnk. This is certainly a mistranslation from math-speak to normal-speak. I suspect that what is actually meant is that the arrangement of numbers WITHIN each Sudoku matrix is more random than within the AVERAGE unconstrained matrix. A simple example is this: If you know everything about, say, a 9x9 matrix consisting of all 1's, and I ask you "A certain square has a 1 in it. What is the number directly to the left of that square?" you can answer very very easily. On the other hand, if you know exactly what the arrangement of numbers in a Sudoku matrix is, and I ask you the same question, you're going to have a very hard time answering. Your answer will probably be something like "Well, it might be a 2... or a 3... or a 5, 6, 7, 8, or 9." If anyone is interested in first reading the publication, it is available for free from http://rspa.royal...hing.org just search for sudoku. The article should discuss more on what entropy is than trying to over-simplify things as 'more random than random'.